From the best known to the most obscure, this program discussed the many roles filled by women during the deadliest battle of the Civil War. With information gleaned from diaries, letters, and newspapers of the period, many parts of this program are told in the actual words of the women who lived through the battle. Jane Peters Estes has been a living historian and active member of Delaware Valley region historical organizations for almost 30 years. 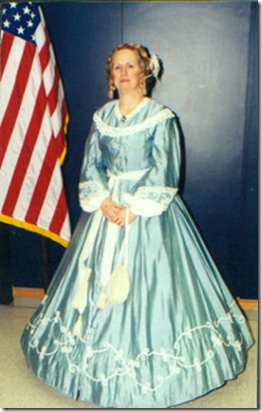 Her current affiliations include; Historical Military Impressions, GAR Museum, 26th and 28th PA Volunteers, Mount Holly Historical Society, New Jersey Civil War Heritage Association, General Meade Society, and the Union Patriotic League. She has had articles published in Civil War Lady Magazine, Citizen’s Companion Magazine, Philadelphia Bride Magazine, and People Magazine. Jane last shared some of her expertise with members of OBCWRT in 2011 when she presented “Christmas Past,” a delightful overview of the origins of many of our Christmas traditions. Her many programs and presentations include: Civil War Nurses, Fashions of the 1860s, Grave Matters (Victorian Mourning Customs), Wedding Customs and Traditions, Women’s Lifestyles of the 1860’s, Vivandieres, Pets of the Past, and The Battle of Gettysburg: Where Were the Women? This entry was posted in Meeting archive on February 1, 2015 by hlj.